I don’t know about you, but I am going to be making a pretty epic wish at 11:11 today! ;-) haha! Place chicken in the crock pot.In a bowl, mix bottle of barbecue sauce, Zesty Italian Salad Dressing, brown sugar, and Worcestershire Sauce. Pour over chicken. Cover and cook 3-4 hours on HIGH or 6-8 hours on LOW. Thank you! 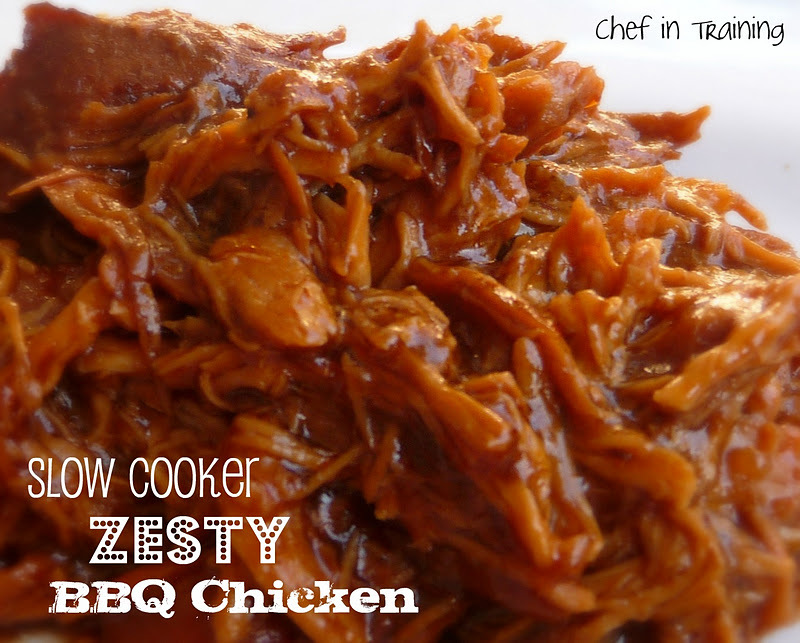 I love slow cooker recipes, and just printed this one out. I like a 'hubby' tab-and why not a 'kid' tab, too? Keep them coming! That looks delicious! I love crockpot recipes. My husband thinks I'm funny with my blog because I'm always taking pics of my food. He started taking pics of things he makes too. Silly. This chicken looks like something my husband would like as well -- the fact that it is a crockpot recipe makes it a hit with me! I made something like this last weekend. I used pork shoulder, mango preserves, masterpiece bbq sauce, garlic powder, onion powder,chicken broth. I am going to try it with again with your idea of the chicken breast. I love your blog. I look at it everyday. Thanks for making me smile everyday. Wow! Definitely going to try this! Any preference as to the brand of mesquite BBQ sauce? This looks so yummy. I love crockpot cooking. Making this tonight! In the crockpot, i used dark brown sugar not light brown. wasnt sure. what do you use? Saw this recipe on Pinterest and made it this evening. It is SO good! My family really enjoyed it. Literally just made this for dinner and it was amazing. I seriously cant wait to try your other recipes!! Hello Nikki! So glad to have found your blog via pinterest. I've tried a handful of your slow cooker recipes and have had some yummy results :) I'm thinking of trying this recipe for some friends coming over this weekend, but have split chicken breasts in my freezer. How would you recommend cooking this with bone in, skin on chicken? Should I cook the chicken in the crock pot on its own, remove the meat from the bone and shred, put shredded chicken back in the crock pot, and then add the sauce ingredients? Thanks for the recipe! made this today and everyone LOVED IT!!! I just made this for dinner. I used honey BBQ sauce and fat-free Italian dressing since that's what I had on hand, and it was delicious! I made this the other day. It was A M A Z I N G ! ! ! I added baby yellow potatoes cut in half and corn...We ate it like more of a stew...My Husband said I could make this ANY time I wanted...he LOVED it! Thanks so much for such a great recipe. I will be blogging about this soon and will definitely link back to you! Thanks again and I cant wait to try many more of your recipes! do you think this would make enough for 12 women? Um it smells delicious and tastes amazing. But I'm getting ready to serve it. It seems a little runny. Any suggestions?